London Transport purchased 84 Guy Specials in 1953, for use on lightly used country area routes. These unique vehicles were a mix of the Guy Motors Vixen and Otter models, which where combined with an attractive 26 seat Eastern Coachworks body design. The rear of the GS shared a close resemblance to the RF, which had already become the new LT standard single deck type. The majority of vehicles remained in service until the mid 1960's when LT's desire for standardization finally resulted in the replacement by the RF type. Three examples were retained as staff buses until 1973, while another GS was used by the London Transport St John's Ambulance Bridge as a mobile dressing station for many years. A small number of buses also passed to the new London Country Bus Services when London Transport's country area passed to the National bus Company in 1970. The last vehicles were withdrawn by LCBS in April 1974. Many of the cast off GS buses found further service with independent operators which among others included Tillingbourne Valley Services, Southern Motorways and West Bromwich Corporation. The GS has also proved to be a popular choice with preservationist's, with a surprisingly large number of vehicles from this small class, still active today. If you'd like to know more about these vehicles you might find a visit Ian Smith's excellent Ian's Bus Stop worthwhile. It contains a wealth of information about the GS and most other London bus types. The GS model was announced in early 2004 at the annual London Toy Fair however the first release did not occur until the Spring 2005. 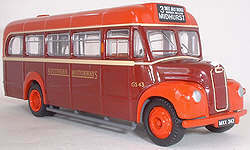 Not surprisingly the majority of releases have feature London Transport vehicles however EFE have also issued several GS models in the liveries of independent operators who acquired them after their withdrawal by London Transport. The first such model appeared in November 2005 and came in the maroon & red livery of Hampshire operator Southern Motorways.